All of you know her as EB, some of you know her as Darcy, and most of you know she’s a pretty special lady. She is the one who makes sure that everyone who writes gets an answer, every order gets filled, and everyone with a computer problem who has a Cloudeight Direct service key gets scheduled. Without her, Cloudeight would probably not be around anymore. She’s a fighter and she really cares and she makes the ideas I come up with work. My head’s always in the clouds — which is why we are called Cloudeight…not really…but my head is in the clouds. She makes this site work — and she does come up with some great ideas too. Today is her birthday and I hope you will join me in wishing her all the best. What I wish most for her birthday is that all her dreams come true. You probably don’t know this but she used to own a bar, and that’s where I met her. The bar was called Michigan^Tavern. Honest! I stumbled into her bar and starting fighting with her (it’s true). For some reason, in spite of my arrogance and contentious nature, she became my friend. I was a helpless nerd who knew almost nothing about computers then. My son was in a rock and roll band — and I made the world’s worst looking site, but I was proud of it. I showed it too her and rather than telling me it looked like a pile of junk she redid the entire site — she took her time to make the first web site I ever made look great — and she barely knew me and didn’t know my son at all. What she did with the junky looking site I made was amazing — but she never took any credit for fixing it up. The year was 1997 and the bar Michigan^Tavern was virtual — it was a chatroom that EB and some of her friends had created. So we met in a virtual saloon and Cloudeight was born. In 1998, after she took me under her wing and taught me a lot about making web sites and we created the first Cloudeight site. 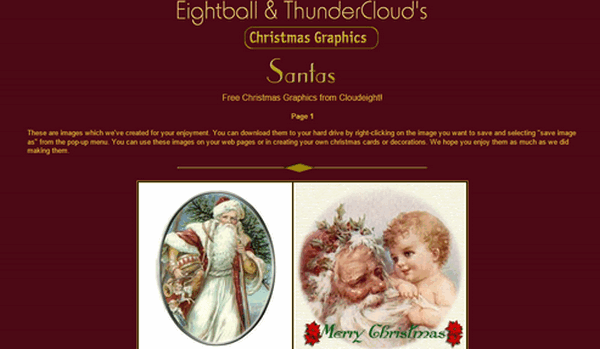 It was called “Thundercloud and Eightball’s Christmas Graphics and you can still see it by clicking here. We both use to work other jobs back then. Every day whoever got home first would check the counter on the site to see how many people had visited. I can remember the day we got 50 visits and we were sure we were on our way to Web stardom — ha! — but there’s something beautiful about naivete. The excitement of having 50 visitors encouraged us and we kept working together. One day, EB sent me an email with a scrolling background — and it had music playing. I thought she was magic! “How did you do that?” , I asked. We figured it out and started making stationery. It was then we created Cloudeight Stationery and it became wildly popular — at our peak we were getting 3 million visitors a year and our stationery became the most famous stationery on the Web. 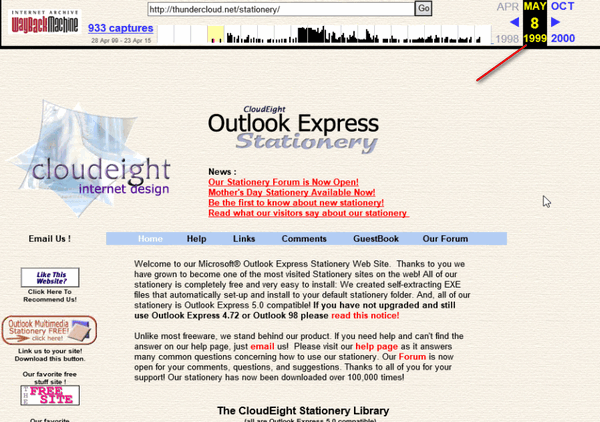 The Cloudeight Stationery “Visions” Stationery Collection for Outlook Express – October 18, 1999. We loved our jobs and we were so excited when we were working on a new stationery collection. We’d show each other what we had designed and couldn’t wait to release it to our subscribers and visitors. Cloudeight Stationery grew and grew – and Cloudeight became a business and our only job. In 2002 we started Information Avenue and later InfoAve Premium to pass along some of the computer tricks and tips we’d learned over the years. It’s a good thing we did because when Microsoft introduced Windows 7, it had no email program, and therefore Windows 7 users couldn’t use our scrolling / musical stationery – our bread and butter. We had to completely re-invent Cloudeight and staying in business became a weekly struggle. I have no doubt that if it weren’t for Darcy’s kindness and caring, we’d have gone belly-up several years ago. She never gave up and we came up with some other ideas and we’re still around. Cloudeight Direct Computer Care was her idea, not mine, and it really has helped us keep sailing on — and it really helped us get to know the folks who helped us through some very dark days. Whether you know her as Darcy, EB, or both, she’s quite a lady and I’ve always felt quite lucky that, despite my cantankerous, contentious, belligerent nature, she has always been able to see through all of that and saw a different part of me — the part I never show the world — the compassionate, generous, gentle part. We’ve been friends since I walked into her virtual saloon and I’m a better person for it. And any of you who have had the chance to get to know her are blessed too. She’s one in a billion and we’re all lucky to know her. 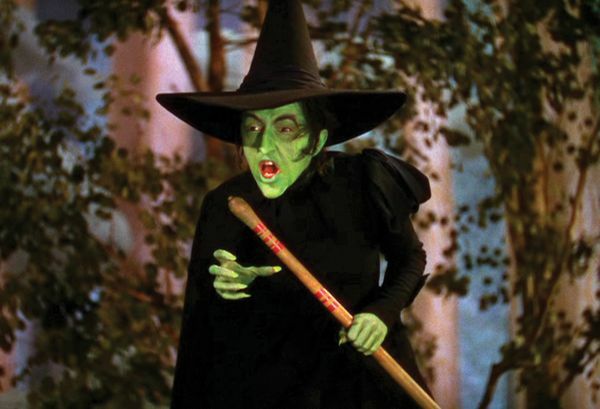 EB getting ready to ride her broom to the grocery store to get me beer. Darcy and I have had our ups and downs. We’ve been partners for almost two decades. She’s always been the one I’ve counted on when things weren’t going so well. She takes my ideas and makes them work – or tells me how crazy I am depending on the idea. She is my partner, she is my friend – and whether you know it or now, if you’ve ever had any dealings with Cloudeight – she’s probably your friend too. Happy birthday Darcy. I hope your next trip around the sun is also a good one. Happy Birthday Darcy. May all your wishes come true. I remember those stationery days and I also was involved with stationery groups. Learned to write them and after all these years, am still involved in a couple of stationery groups. Thank you for all the effort and time , over all these years, that you have given to us. Happy Birthday Darcy! How great it is to get a glimpse of your friendship and how it grew. May you have many great and happy days ahead and much success with Cloudeight. It’s my favorite site for learning about the various aspects of computers. I have used your computer service, too, and it was a great experience. Thanks and again, Happy Birthday. Oh yes, I hope one of these days, your stationery will work with Windows 7. I loved using it when I had Windows XP! Happy Birthday Darcy!!! I am a loyal and vocal fan of Cloudeight. I have many folks agree when I have told them to visit the best help on the web. Thanks, have a special day, and keep that other guy in line. Hi Darcy, I want to wish you a very Happy Birthday and the best year yet!!! I have had the pleasure to enjoy, brag & share so much information that I have learned from the two of you since way back in the olden days. If it weren’t for the two of you I probably would never have touched a computer. So glad to have you both in my life! Keep up the great work and yes, may all your dreams come true! Very Happy Birthday to you today Miss Darcy. Even the Wicked Witch of the West needs a place she can call home and Cloudeight has felt like home since the day I first discovered it so many years ago. So today, on your very special day, as they say in Disney World, “Have a magical day”. Happy Birthday Darcy! and a big thank you for all the help on my computer you have given me and couldn’t be without Cloudeight. Have been with you guys for sometime but found it interesting how it all came about. Happy Birthday Darcy! Have a wonderful birthday and a happy, healthy year ahead. Remember calories don’t count on your birthday! Happy Birthday, EB! May all your good dreams come true. A great big HAPPY BIRTHDAY DARCY Hope it is a wonderful day for you and all your wishes come true. God Bless you Thank you for all you do for Cloudeight I loved the stationary you invented and sure hope one day it will work with Windows 10. Thanks for all you do for those of us out in computerland. Thundercloud has been my home page for more than a decade. I have used the stationary and continue to receive your newsletter. I also pass on your articles about good and bad software to friends who need to know. thanks to both of you for your help and expertise. Happy Birthday Darcy, Hope you have not only a wonderful day but a wonderful year as well. We’re so lucky to have you there guiding us through problems as well as pleasure. You’ve made my life using a computer a delight rather than a bad situation. We all rely on you for information and help and you come through with it all the time. Thanks again and may this be an absolutely great year for you in all that you do both at work and at home! Happy Birthday Darcy! I sincerely hope you have many more and I also hope you’ve had a great day. Thank you for being the wonderful caring person that you are. I don’t know what many of us would do without your knowledge and help. I love the story about how your business came to be. Hope it was a great one for you and hope you have many many more. the world needs more like you so keep on keeping on. Happy Birthday, Darcy. The world is a better place because you’re in it. Believe it with all your heart. You’ve helped so many of us with, as an 87 yr-old friend of mine calls it, my “computer machine”. I’m writing this for my Mom, who has been a part of the Cloudeight family for 20+ years. As her eyesight diminishes, her eyes still twinkle when I tell her the latest Cloudeight news; especially when EB gets back at TC for his latest vitriolic rant. She and I are grateful not only for your expert tutelage but for making us all part of your extended family, and in that spirit, I wish you, Darcy, a Happy Birthday! Cent’anni! the everchanging world of computers and maintain his sanity. Have a great day!! Happy Birthday Darcy! May all of your dreams and wishes come true…. “Happy Birthday” Darcy!!! You really are a special lady. You’ve made the world a better place, and helped more people then you will ever know. Many more Birthdays. You and TC have made the Computer World a much easier place for us all. How lovely to hear you praising Darcy, TC. We knew all along how much you loved and appreciated her but nice to read your acknowledgement of same. Happy Birthday Darcy. Happy Birthday! I have trusted you guys for years. I do not know what I would do without your wisdom and experience. With life’s best things for you! Happy Birthday, Darcy!! I would need TC’s creative writing abilities to tell you how much I appreciate what you two do for we novice computerers (TC, is that a word?). I hope you’ve had a terrific birthday, Darcy! You’ve helped many people with your honesty, caring, and expertise. Thank you. Happy Birthday Darcy. Thank you for all you’ve done to keep your organization going. I used to use those wonderful stationery selections in my Outlook Express email too. They were terrific. So I’ve been around your business for a long time too. Now, how about getting your partner to show you some more respect. His tribute today was grand, but not his usual fare regarding you. Even in jest, women don’t deserve that kind of verbal abuse. No one does. To the casual user, it looks like he actually means it. Slams hurt, even if you know they’re “intended” to be funny. Maybe it’s time for him to have a change of tongue, since he already seems to have the right kind of heart for you. I believe the women here would support me in this. Let him know, women, that he needs to stop the verbal abuse, even if in jest. Try another approach to humor that doesn’t at least “seem” to demean, whether it was intended that way or not. Why add that kind of negativity to such otherwise majorly helpful info you put out? Just trying to be helpful. Thanks for all you do for all of us, Darcy. For Pete’s sake, Charles, can’t you see with the fun banter TC loves her? When he stops then she’ll know he no longer cares about her. Lighten up! I’d love to have someone care about me that much that he’d post that kind of kidding. I’m afraid you’ve underestimated what we women enjoy, you’ve got us pegged as people who can’t enjoy humor. And that’s what it is, humor. Happy Birthday Darcy! HAve a great day and many more. You are a great person to help so many of us. I have learned a lot over the years and have used your services . Thanks so much for what you do for others. Hope you have had a very blessed Birthday! Have read your newsletters for many years and trust the advise that I find in them. When I first got a computer I had no idea what I was doing! Thanks so much for all of the help learning so many things. Very Happy Birthday Wishes to you Darcy, with many Thanks for all the help you have given me over the years.! Happy Birthday to you, happy birthday to you, happy birthday dear Darcy, happy birthday to you!!!! Hope it has been the best one ever and that you have many more just like it. Happy Happy Birthday Darcy! I hope your day was a wonderful one… I, too, am always talking about Cloudeight. I have been a premium member for many many years, and have helped when I can. If it wasn’t for both of you, I probably still wouldn’t be using a computer. With your help, it has become my favorite pastime. Best wishes to you today and for many years to come. Thank you for all you do!!!! Warmest Birthday wishes to a wonderful lady and brilliant computer genius! Happy Birthday, Darcy! I greatly enjoyed reading the tribute to TC’s friend and partner. I’m so thankful you two found one another and brought CloudEight to the world of struggling computer users like myself. Darcy has worked on my computer several times, and she has always been both kind and efficient. I am happy to count her a friend and mentor. Many, many thanks, EB! Happy Birthday Darcy. May you have many many more. Keep up the wonderful work that you do, that you both do. I too loved & used your stationery for many years & still miss it. HAPPY BIRTHDAY DARCY! Hope you had a wonderful day and many more to come. I also miss your scrolling stationary will one day work for a gmail account. That would be super. Have a blessed evening. I think I’ve been with Cloudeight since the beginning of ‘time’ and how would I have survived if I had not found Cloudeight. Happy Birthday, Darcy. I am glad you are in the business of computers, you are a life saver and very appreciated. Darcy, Happy Birthday! You and TC have been my Internet friends for a long time and I have learned so much from you both. You are the best on the Internet. I hope you have a wonderful birthday and God Bless you! Happy Birthday Darcy. May you have many more in spite of how TC picks on you. LOL. All the best. Sorry I am a day late but the greetings are the same Happy Birthday , Good Health.and may all your dreams come true.Hope you had a great day and many more. Thanks for all your help you are great! Happy Birthday, Darcy. It has been a pleasure having you and EB around all these years. For me, it has been since the late 90.s I have always enjoyed yours stationery and computer tips. When Outlook Express was still around it was a ball having e-mail. Now it is more of a necessity. In fact, I have a rather large book of tips and tricks that I have compiled over the years. From Win 98 thru 8.1. Now we will be staying with you for Win 10 and I already have several Win 10 pages in this book. May your Birthday and all the days to come be full of sunshine and good things for you. Thank you for all you do for us. You are loved and appreciated! Hope you had a very special birthday celebrating with family and friends. Happy Birthday Darcy , A special thanks to the team who has helped so many us through the best of times and the worst of times with our crazy machines. “HAPPY BIRTHDAY” DARCY, All the very best for you!!! Darcy, I so hope your day was just as special as you are. Happy Birthday and I pray you have many more of them filled with good health and blessings. Happy Birthday to the special person you are, and we all appreciate you! I was glad TC finally was telling it like it is about you till he bammed it with the witch pic. ! The words were saying you’ve been the wind beneath his wings. Happy Birthday Darcy! You ARE a great person and I am privileged to have had you help me with my computer! The two of you together are awesome and want to see many more years ahead! Yours is the computer techie newsletter that I depend on! Thanks for being there! but I am the lucky one for having used your wonderful service. Darcy, I hope you had a most wonderful Birthday! I’ve been with Cloudeight many years and appreciate all the hard work you’ve done to help so many of us for such a long time! I often sing your praises, and am so proud and thankful that you and TC are there to help us through the jungle of computer changes. You have helped me at least twice on Direct Care computer sessions, and I can only say you are amazing! You deserve the best birthday ever! I’ve considered both of you friends of mine for many years now. Happy Birthday, Darcy, and thanks for making the world just a little bit kinder, gentler place!! The happiest of birthdays is wished you Darcy. I have been on this journey with you and TC for many years and have learned… well, not nearly as much as I should have because I would rather enjoy my computer and leave the techie stuff to “my guys”. Thank you and may you be richly blessed – daily. Happy, Happy Birthday Darcy! Thanks for teaching me so much and making me look smart to my family and friends! Darcy, I hope you have the happiest of birthdays today. Thank you for all your hard work to make sure we are somewhat knowledgeable when using our computers. I appreciate you! Happy Birthday Darcy. Was so happy to see this “Partner” being so thoughtful of you for a change. I agree with “Charles” to change how you speak of Darcy..Fun or not??? not funny…I like this ‘one’ today knowing he really does have a heart! Happy Birthday Darcy…..have a fabulous day!! Wishing you all the best & have a great birthday Darcy. All the very best wishes for now and the future in the hope, that you will always be in good health. I have been with you for many years now and I would like to thank you and TC for the time and effort taken to keep us “oldies” safe and up to date in the world of Computers. Thank you and stay safe. Happy Belated Birthday Darcy. We wish you great happiness in the years to come. You made my daughter very happy when you work on her computer and again thanks for your time, knowledge and description of what you did. YOU THE BEST!!! Darcy, Happy Birthday, from me and from the whole Emsisoft crew!!! May all dreams come true. You are one of the wonderful people I know in the business. Hope your birthday was a happy one. You deserve it after all of the work you do on our computers and in keeping TC on the right path! 🙂 We all appreciate everything you do for us. Happy Birthday & MANY more!! Happy Birthday Darcy & the very best of days to come. Thank you for all you do to make this site the best available information. ..I am so appreciative of your honesty and loyalty to your friends & fans of Cloudeight. May God grant your every desire. I have been with you (two) since the beginning – literally – and like TC consider you a friend and master, and have learned soooo much from you which I have passed on to my computer family. Now that I am retired (79 y/o) from teaching computer software, I still promote Cloudeight and Thank God for all that you have done for ALL OF US. May God’s Blessings be upon you this day that He gave you to us in this world, and all the days that He gives to you and may He continue to bless us with many more years of health, friendship and Love. You are both in my thoughts and prayers. God Bless+ you and Yours for MANY more years. Darcy: A very Happy Birthday, wishes for a great year, and many more! Happy birthday Darcy, have a real good un. Happy Birthday, Darcy! May God bless you always and thank you and TC for all the computer help you’ve given so many for so many years. You’re both super! And fun. Darcy, I hope you had a fabulous birthday and will have many more to come. I remember the days of the scrolling musical stationery. I loved it, and looked forward to each new creation you made. Well, Microsoft put an end to that, but it was wonderful while it lasted. And now, I really look forward to receiving Cloudeight InfoAve with all the great computer information and tips. What a dynamic duo you and your partner make! May God continue to bless you both abundantly! I hope you had lots of cake and ice cream on your birthday. And, please know that you mean so much to so very many people!!!!! I use your site all the time for hints & programs…….the greatest! It also happens to be our twins birthday & our 55th Anniversary. Happy Birthday Darcy. Thanks for all you do. A very Happy Birthday to you Darcy (EB). I know I speak for thousands when I say we are so happy that you and your sidekick have toughed it out to bring us all one of the greatest and helpful computer sites going..hands down! Have a wonderful time when he celebrates with you at a real bar this day. HAPPY BIRTHDAY DARCY! Sounds like you work with a great guy. I mean a funny guy. hee hee! Darcy, I want to wish you a Very Happy Birthday. I wish I could have put this on one of those Happy Birthday scrolling, musical stationery which you made and I so enjoyed using. I downloaded many of them and always looked forward to the new ones when they came out. You both have been so helpful to me in learning how to use a computer. I met the two of you back in the 90’s and copied many many of the tips you gave on using a computer. I taught lessons at a Senior center to many friends and gave them the information you had given to me. I also made sure that they used your site for their home page. They still do even today, and of course, I do also. Thank you for fixing my computer when I needed it and answering my questions also. I still have two service keys to use when I need your help again. I hope you had a wonderful birthday and pray that God gives you good health to have many more. I hope you have a wonderful birthday and many more to come. You have been a life-saver to me on many occasions and I love you for all the help. Continue to do what you are doing and I will continue to love you and wish you well. “Happy Birthday” Darcy. I wish you many, many more. Without you my computer skills would be zero. Love you guys. My dear Darcy, So sorry I didn’t catch this until today. Wonderful to know there are so many old timers like me that you have kept from trashing our “machines”. Have lost count of how many times you have come to my rescue. Now you have the major job of getting us all on “10”. I wish you many more Happy Healthy Birthdays. I have been with Cloudeight since 1999. By chance I found your site and loved the stationary and must have used all of it. When things changed for all of us ( computer wise ) times got tough! Then when things got bad for Cloudeight I got terrified and did what I could to help, I mean what we would ALL do without all the great things that Cloudeight provides us with? So when you came up with the idea of Cloudeight Direct Computer Care WOW! To me that was the most fabulous idea of all!! Next to all the Information you give us of course. I hope you have an idea of just how much you are cared about and appreciated by hundreds and hundreds of people! I want to make a pledge/challenge of support: For every month that TC does NOT say anything bad/nasty in the newsletters about Darcy -AND- says at least one nice thing about her, I will make a “gift” of $5.00 to support you. He may think it is funny but IT IS NOT!! We ladies need to speak up and get this kind of behavior banished from ALL forms of media. I love the newsletter and have learned so much from it. But have not supported it as I would like because of this unkind behavior. Please change!!! and know there are other ways of having fun. If you don’t know how to have healthy fun, then get some guidance from someone who can teach any “old” dog new tricks. Sorry but I think hitting the pocketbook may be the only way to get his attention. Any one agree?? If so please accept this challenge. Thanks M. A. Happy Birthday Darcy! Hope you had a super one! Thanks to you both for making my life so uncomplicated!!! A very Happy Belated Birthday, Darcy. I pray that you have many, many more happy birthdays. Thanks to you, my computer is working well. I used one of my two “Keys” and you came in and cleaned up my computer. I have been with “Cloudeight” since the beginning and have downloaded all of your stationary. What beautiful art work that was. I used it all the time. May you and TC remain friends forever. I just turned 77 on the 27th of July and I need your guildance to keep my omputer running smoothly. God Bless you and TC. Happy birthday! Thank you for making my Cloudeight home safe and secure. One in a million just does not do you justice. A very happy and healthy birthday. Happy birthday, Darcy, hope you have a great year. Darcy, I do hope this birthday was the best one ever, and that you’ll have MANY more to enjoy. I have learned so much from you guys over the years. I started on Dos with my first little bargain computer, and I don’t remember how I got connected to Cloudeight, but it was a blessing that I did. It wasn’t long ago that you worked on my computer that had filled up with backups. It was amazing to watch you at work, and it’s humming right along like a new one now. Thanks again and I hope your day is amazing. Marge R.
Happy Birthday Darcy and I wish you many,many,more and thank you for the work you have done on my computer and for all the tips you give !! Wishing you a very Happy Birthday Darcy. Hope you have a wonderful day — and only the best for the rest of the year. Thanks for the times you’ve righted my cranky computer. Been with you and TC for a lot of years and learned a ton of things. Here’s to many more great years. A late, but very heartfelt Happy Birthday to you, Darcy. Because of you and your stationery and my son helping me, I began taking lessons to make my own. Thank you so much for guiding me and countless others to stay safe, smart, and not afraid on The Internet, and also for those you helped during your nursing career, and for keeping TC alive during his health scare. You are one smart lady! 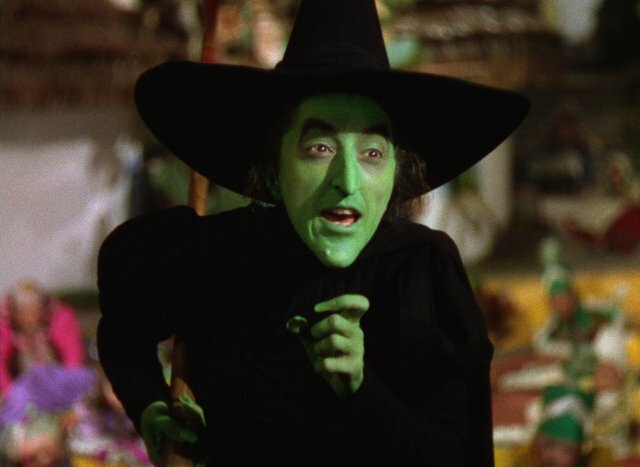 And, I must say, very fashion-forward with the exclusive “MH” makeup from the Margaret Hamilton Collection. Happy Birthday, Darcy! Have a wonderful day! Wishing you a Belated Happy Birthday! Hope you had a Great Day! Happy Belated Birthday Darcy, Hope it was one of the best ones ever. Happy Birthday Darcy, Sounds to me like you are lucky to have each other, and I feel fortunate t o tell ,u non-techie non-nerd friends where to get the best information (most of the time). Happy Birthday, over and over again. I must confess, if you had a “High Speed Modem” of either Microcom or DEC, then we likely conversed over Bee-Bob-Dee-dum. Happy Birthday and many more to come…D. to many of us computer users over the past decade. We have learnt from you many valuable tips and hints that have saved us many wasted hours in trying to solve problems that popped up in our computers. Even though we are many miles away from you, it seems that you are still living nearby. May you continue to enjoy good health and we all hope that you will be able to guide us on the right path for years to come. What a lovely tribute for a lovely lady. HAPPY BIRTHDAY Darcy! Hope it was a good one. I used a lot of Cloudeight Stationary when we still had Windows XP. It was a sad day for me when Windows 7 came out without Outlook Express. You have taught me so much that I would be clueless about without the newsletter. And….. I personally think the ribbing that Darcy gets is funny. It would NOT offend me in the least if it were me. Wishing you all the best in the coming years. A Very Happy Birthday EB. Many, many more. What a great story on how you 2 met and started Cloudeight. I loved the stationery when I had XP. I wish you all the luck with Cloudeight and help out as much as I can. You guys are SUPER GREAT! Keep up the good work. Happy birthday dear Darcy from Tokyo, Japan. happiness & many more happy birthdays!! Happy Birthday Darcy. I hope your day was wonderful. You are the best. I wouldn’t have had my computer running so smoothly if it wasn’t for you. I have been with Cloudeight for a lot of years. I don’t know of any web site that has the best knowlege of computers and all the other things you do. I recommend you to everyone that I talk to that has computer problems or needs an answer to a computer problem. You two are the best. Happy Birthday Darcy, even if it is a couple of days late! Many moons have past since I first found Cloudeight…I had Windows Millenium then. That should be telling you how much I have depended on the knowledge you and TC have passed along in your newsletters! I also loved the stationery and was heartbroken when I wasn’t able to use it in the future versions of windows. Now I am looking forward to Windows 10 and reading all the useful information the two of you will be providing for all of us. Thank you so much for all you do and hope your birthday was a happy and wonderful one! Happy Birthday, Darcy! And many more, too. I know I wouldn’t enjoy the computer as much as I do without the help you guys have given. Darcy, I hope your Birthday was a lovely one shared with your loved ones! I too have been with you since the stationery days, how wonderful they were, and now your Direct Computer care keeps my computer running smoothly, and your site offers so much more. I sincerely hope you and TC are with us for many more years, what a great team you make. Thanks for all the help and good advice you’ve provided over the years. I hope your business triples before your next birthday. Happy Birthday Darcy! I also was a Cloudeight stationery fan and used so many of the scrolling musical ones in my emails. A very big, appreciative Thank You for all you do for your “fans”. Have a truly excellent birthday! have been with you since almost your beginning & I would have given up on the computer years ago if it had not been for you. I certainly hope you enjoyed your day as much as the joy you bring to us each day. May you have a great year and enjoy each day. You have given us so much, I wish there was more we could give to you. May you enjoy many prosperous days this year, right up until your next birthday! Happy Birthday Darcy, Have good time celebrating! Happy Birthday Darcy! Have a great time. Thank you for all you’ve done throughout the years to help us. People have asked me where I get my information and I always refer them to your page. Aug. 5th is my birthday and I decided to start counting backwards. Leo is a great sign for us lions. Hear her roar TB! Cloudeight for my start page. Your computer info is so useful. Carry on with your great work and have a wonderful year! BTW thanks. Happy Birthday Darcy. Have been on vacation and not online every day so missed your special day. Cloudeight has been with me for many years and you have been such a help, couldn’t do without you. Hope you had a great day and hi to TC too. Have a wonderful birthday, Darcy. I our special talents a few times, and been soooooo grateful I am now finding my way around Windows 10, and hope you will be here to help us for many years to come. I hope you have many more. I know I enjoyed watching you fix my puter and my husbands puter. I’m really glad I bought the repair keys. Best wishes for all your dreams coming true. What a beautiful story. Darcy I wish you a wonderful birthday, you are so special to all of us.